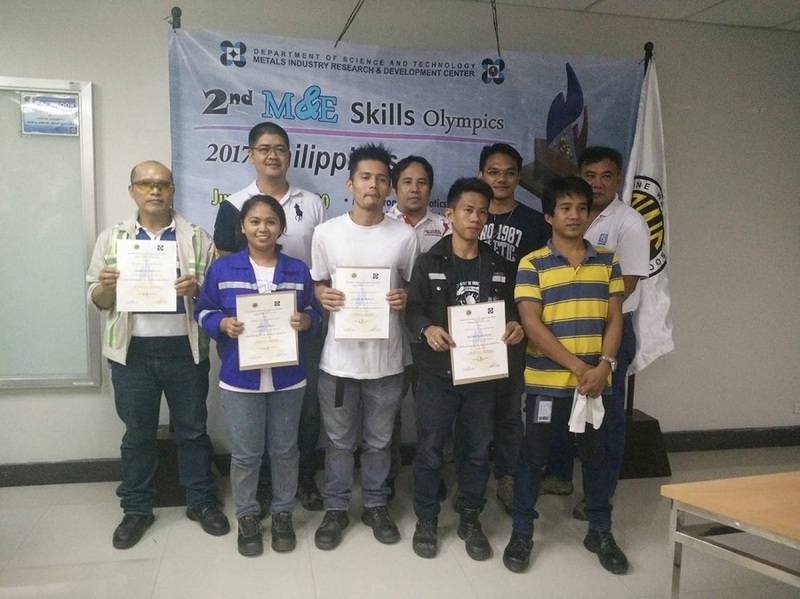 EEI Corporation welders dominated the Shielded Metal Arc Welding Competition (SMAW) – Carbon Steel Plates and Pipes Category in the 2nd M&E Skills Olympics 2017 of the Department of Science and Technology Metals Industry Research and Development Center (DOST-MIRDC), held in cooperation with the Philippine Welding Society which took place last June 20, 2017 at the DOST-MIRDC Compund in Taguig City. Shown in photo are (front L-R) Arnel B. Pantua – 1st Runner-up in the SMAW Professional Level, Janet L. Diaz – 2nd Runner-up in the SMAW Entry Level, Joefil M. Pepito – 2nd Runner-up in the SMAW Professional Level, and Moises B. Manuel – who was named champion of the SMAW Entry Level. Behind (L-R) are their coaches Paul Robles, R. Rodriguez, J. Estrada, and A. Soliven.